Indeed, the core roles of this project are to subsidize international connectivity and stimulate the local demand. There are still few Internet users in Comoros. Of a total of 735,000 inhabitants, only 46,000 Internet connections are available. Moreover, a dedicated Internet line is very expensive — an 8 Mb connection cost more than 1,000 € per month. We had long and interesting discussions with officials, academics, associations and the private sector about the use of ICT and expectations in Comoros. Participants agreed that set ISPs and IXPs up could be useful for the development of the islands. Local content creation, eLearning and ICT capacity building could be also beneficial areas to focus on in order to improve Comorian digital visibility and knowledge. Lastly, improving networks and mutualizing equipment was also noted as necessary to providing better connectivity in the whole country. One of the major issues that came back in most of our discussions was the restriction on the use of VoIP. Indeed, it is not possible to use applications such as Skype or Viber while Comores Telecom locks VoIP use unless users are buying a public IPv4 from them. Comoros is not the only country where VoIP is restricted. Operators are afraid to loose telephone customers if they are opening VoIP even if they can gain Internet users. Since 2008, the international connectivity has been boosted in Comoros. 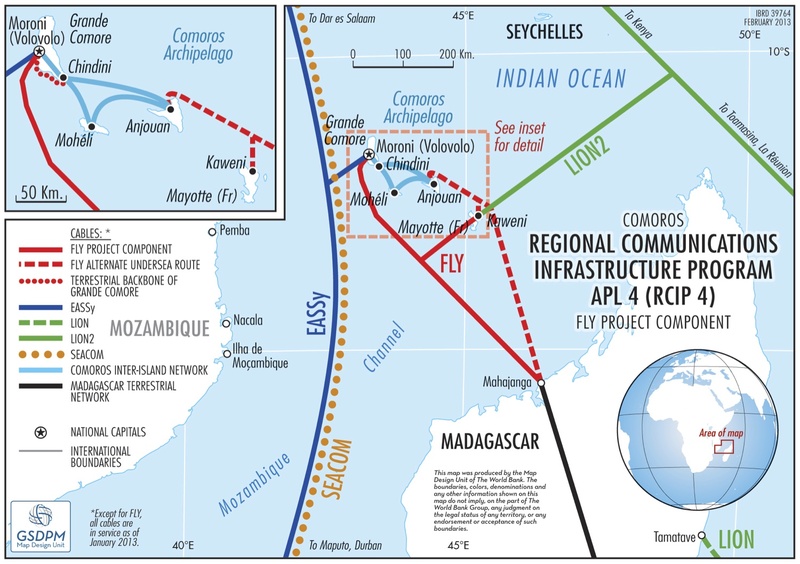 The country is linked to the EASSy underwater cable and the FLY/LION project should secure connection with others countries as shown bellow. Solutions to improve international connectivity and stimulate the local demand need to consider the limited size of the country, the repartition of GDP among the population, the role of ICT in the economy, the support of the diaspora, and of course the national grid. Power is a big challenge in Comoros where the grid can be cut off for several weeks in secondary cities. Technical capacity building has to be done properly in order to empower the local economy and reach the last mile. Thus, Comoros expects to develop its economy through ICT and Comorians are currently building the base with large-scale projects. We are just starting our consultancy and our goal is to provide proper recommendations to the Government of Comoros to improve their inhabitants’ life and cultivate strong ties with the Comoros diaspora using ICT tools.